If you want to get a clearer understanding of how government works, follow the flow of money. You’ve always known “money talks.” Big Money screams until it gets what it wants. 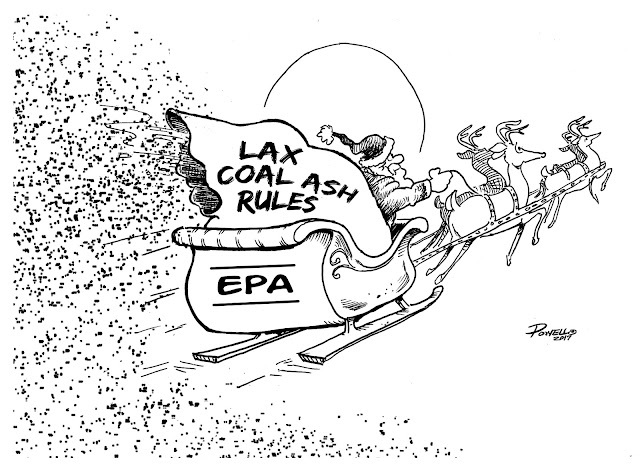 Notice what’s transpiring with the Environmental Protection Agency (EPA) in Washington. Donald Trump promised to “drain the swamp.” To do so, he appointed cabinet members who supported his pledge. Enter Scott Pruitt at the EPA. Born and raised in coal country, the native Kentuckian rose in political prominence as attorney general of oil-rich Oklahoma. And now as head of the EPA, Pruitt is wasting no time in pulling the teeth of the agency which he had sued multiple times in his former job. Idealistically, I believe less government is better than more government. But if the EPA is abolished, as Pruitt has touted, America’s health and safety will be in peril. There would be little, if any, corporate or government concern over the harmful environmental consequences for Wayne County. It’d be all about the money to be saved in the utility companies’ disposal of coal ash and the profits to be earned by companies such as Republic Services and Waste Management. In October, State Representatives Chad Nimmer and Bill Werkheiser, along with Sen. Blake Tillery, wrote a letter to U.S. Sens. 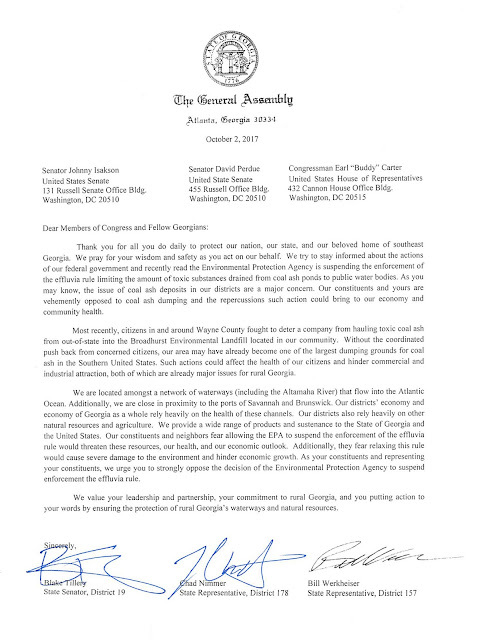 Johnny Isakson and David Perdue and Congressman Buddy Carter asking them to oppose the EPA’s proposal to eliminate guidelines on toxic coal ash. A portion of the letter read: “Our constituents and neighbors fear allowing the EPA to suspend the enforcement of the effluvia rule would threaten these resources, our health and hinder economic growth … We urge you to strongly oppose the decision of the Environmental Protection Agency to suspend enforcement of the effluvia rule.” We appreciate their letter, but you and I must reach out to Sens. 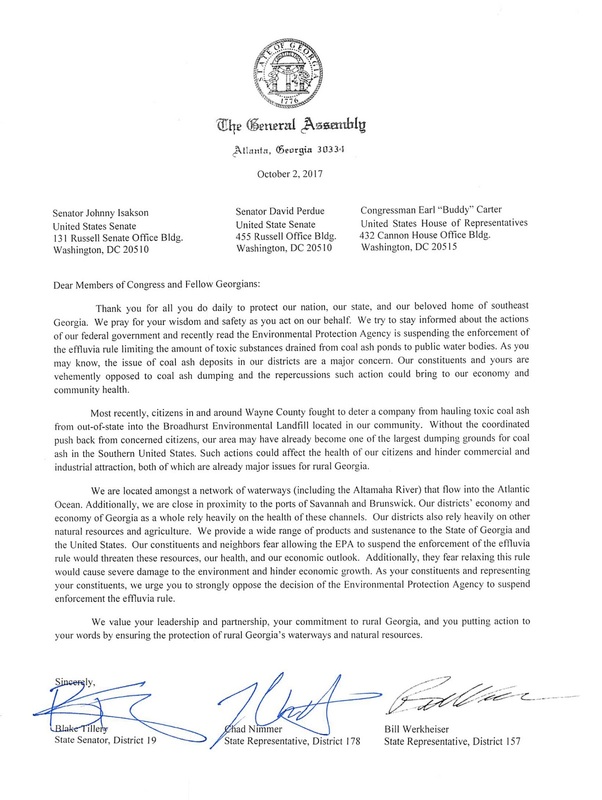 Isakson and Perdue and Rep. Carter, too. You and I may not have the “big” money, but we must make our voices heard or our future will be doomed under mountains of dangerous coal ash.